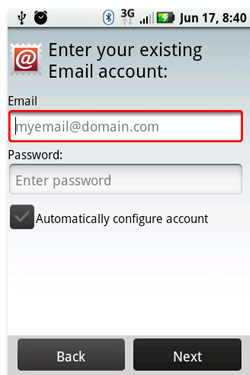 How to Setup email on Android Device? What are Labels and how do they work with CryptnSend? Should be used for labels you use frequently and may want to change on multiple messages. 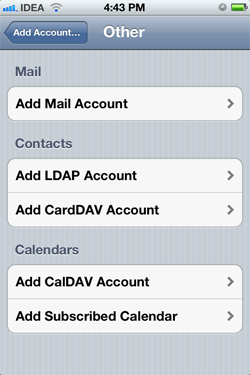 This uses IMAP user flags to store the labels. 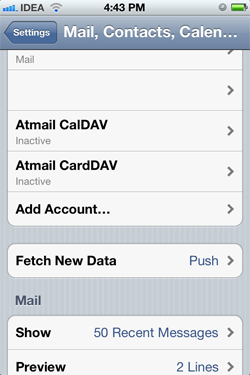 Labels can be viewed with another IMAP mail client. There is a limit of 22 of these labels, which includes any your IMAP mail clients may create. Only use if you need more than 22 labels or IMAP user flags cannot be enabled. Since the label is stored as an additional header in the IMAP message, it requires webmail to modify and re-upload your email message to the server. So avoid using these on large messages. There is no limit on the number of labels that can be created. This is less efficient (particularly on large emails), and can only be set on a limited number of messages at a time. Labels can only be viewed from webmail. Labels can be added and removed from messages as much as you like. However for both types of labels once the label has been created it cannot be deleted (for implementation reasons). 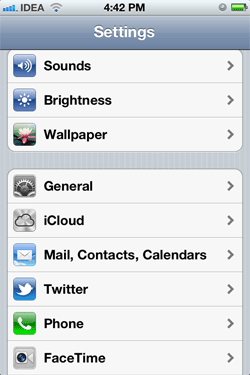 You can however rename the display name or hide labels from display. 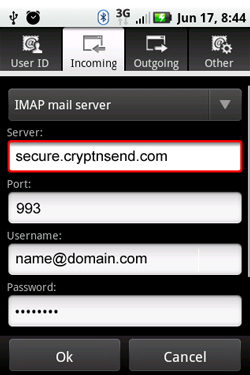 How can I save contacts in Webmail of CryptnSend? Yes, attachments are encrypted and may be downloaded from our secure site. The recipient can include an attachment in their replies as well. 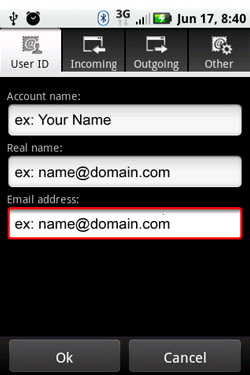 As you use webmail, the addresses of people you email are automatically added to the contacts list. This makes auto-completion the easiest to use when composing a new message. The picker is more useful when adding multiple recipients and groups. The management page is primarily used to edit and organize your contact information. Type in a few characters in the Recipients (To) field, and it will auto-complete by creating a list of possible choices. You can then select an address by mouse or by keyboard. Already added recipients can be removed by clicking the small x. The picker allows quick selection of multiple recipients to your email. Click the To: button, optionally filter by search criteria, and select the addresses you want to add. 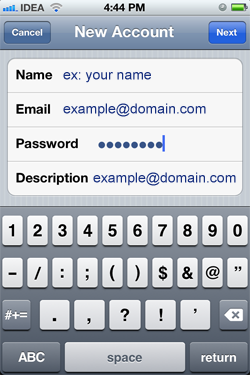 Once added, contacts can be removed from the recipient list by clicking its small x. Favorites - This is the list of 20 most emailed contacts ever, plus the the 20 most recently emailed contacts, plus any you have manually added. All contacts - These are all your personal contacts. Please note that contacts from shared addressbooks are not included here. Groups - Your personal contact groups are listed here. Entire groups can be added as a recipient. Click the small cross to expand a group within the recipient list. 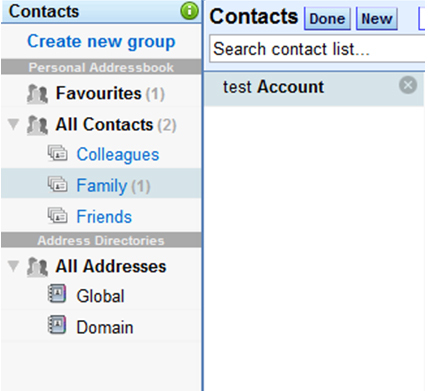 Directories - This allows adding contacts from any shared address books you have access to. The contacts management page enables more detailed contacts management functions including organizing contacts into groups (aka distribution lists), manually add or remove contact information, and edit contacts providing additional information. The left pane lists the various groups of contacts, organized with personal on top and shared on bottom. The center pane lists all the contacts in the group selected to the left. The right pane displays detailed information for a contact selected in the center list. What is Groups and how does it work with CryptnSend? A group is a grouping of contacts for easy management. A group can be used as a recipient, so it can be treated as a distribution list. To organize contacts into groups, just drag and drop a contact into the group of choice. The same contact information can be part of multiple groups, or no group at all, i.e. placed in the default group. "Favorites" is a special group that contains most frequently and recently mailed addresses, in addition to those manually added. 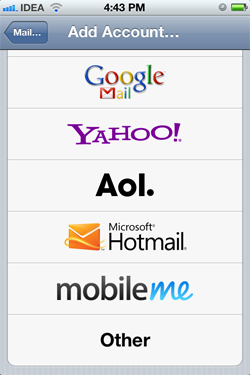 "All Contacts" is a list of all personal contacts webmail knows about, excluding shared contacts. Personal contacts not belonging to any group are visible in this group. Old interface address books & distributions lists are imported as groups. Groups that can be deleted are indicated with a small x which can be clicked to remove the group and optionally all contacts it contains. How to search a contact or email address from contacts list of CryptnSend account? The center pane lists all the contacts in the currently selected group. These can be filtered using the Search field or the index tabs. A good selection of additional fields is available for adding detailed contact information. For most fields, more than one can be defined and the "type" of each field is selectable, e.g. home, work, etc. Display and editing contact information is done within the right pane. 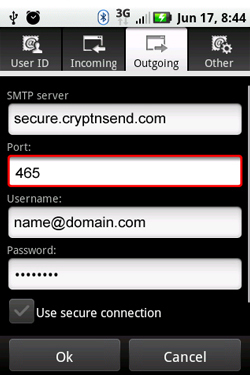 How can I export my contacts to CryptnSend account? Contacts can be exported to standard vCard and CSV files compatible with Outlook and applications. Exporting to a text file listing only email address information is also available. To export the most detailed field information, please use the vCard format. You may indicate which contacts get exported based on group, current selection or all addresses. Export is available through the contact application "More action" pull-down menu. How can I Import my contacts to CryptnSend? 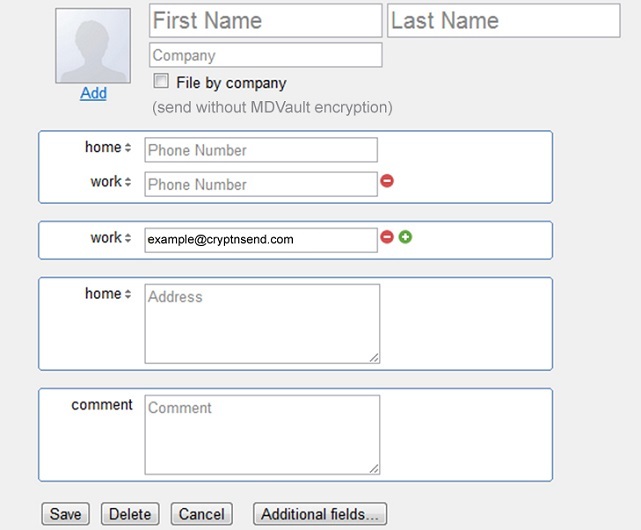 Contacts can be imported into groups by directly typing in a list of addresses or through the use of standard vCard and CSV files generated from Outlook and other applications. Updating addresses from the old webmail interface is available as well. If you select a group to add your contacts, all get added to this group in addition to groups’ setup based on the source file. If an address already exists during an import, it is updated and not duplicated. Import is available through the contact application "More action" pull-down menu. In addition to one's own personal contacts and groups, shared contacts and address books are available. These are listed in the lower half of the left pane on the contacts management page, labeled 'Address Directories'. Contacts within shared address books are indicated by a squared S icon. These might be read-only or editable within the contacts interface depending on permissions enabled for your account. The default Domain directory can be customized to list all mailboxes within your domain as read-only contacts, or it can be configured as a shared address book to do with as you like. Contact the server administrator for more information. Your device will provide instant access to your emails. 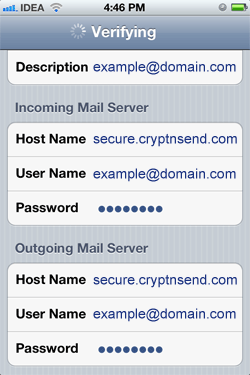 To setup email services of MDofficeMail, from the home screen, open the "Applications Tray", touch "mail" and follow the on-screen instructions. To setup other accounts, follow the instructions below. From the home screen, open the "Applications Tray", and then touch "Mail". Enter a name for your account and the name to be displayed on outgoing messages, then select "Finish Setup". Your account is set up and your Inbox will be displayed. If prompted for the type of account, go to step 7. Enter a name for your account and the name to be displayed on outgoing messages, then select "Finish Setup". Your account is now set up and your Inbox will be displayed. *If you receive an error message "Authentication failed. Please verify your username/password." or "Cannot connect to the mail server to verify your account information. Your server is not responding", verify all settings with your mail provider, including settings for the incoming server and settings to access their outgoing server from other networks. Also see the Tips and Additional Information section. 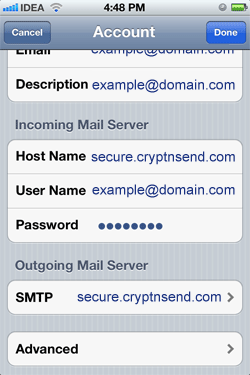 How to Setup my CryptnSend email account on iPhone handset? (your email id), Password: (your password) tap next..
Use SSL: Should be "ON"
Note: Whenever "Save" is requested, please save. Ignore "failed' messages. 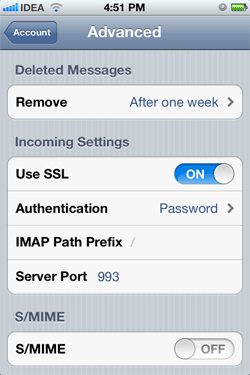 You can continue to configure Setting an Secure email in iphone requires little patience. Select OK again to save all your settings. © Copyright 2016. Crypt-n-Send. All Rights Reserved.